“Maggiociondolo,” Angelo replied. It was a difficult word to master, and I had to repeat it several times, until he explained that it was “Maggio” – May, “ciondolo” – pendant. Of course, the pendant of the month of May! May’s Necklace. 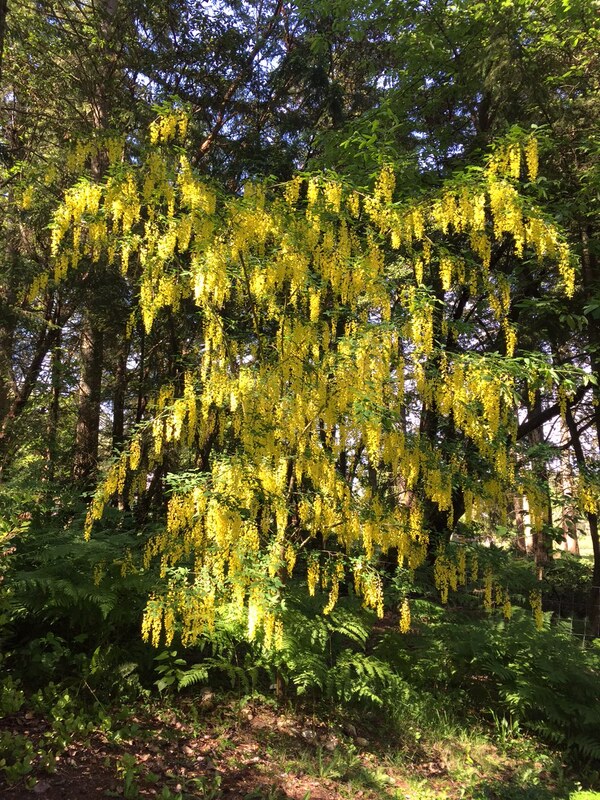 It felt like this Golden Tree was personally welcoming me to Italy for my extended stay, as I wrote down its name in my spiral notebook of important vocabulary. 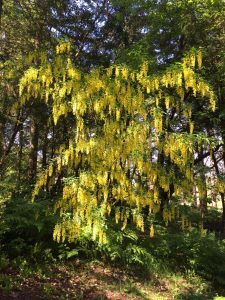 The following May, when I was back home in the Northwest US, I was astounded to see this tree, laden with yellow blossoms, growing on the nearby school grounds. It grew on the Island where I lived! I learned that its common name is Golden Chain, although I always greet it by its Italian name, Maggiociondolo. Embodied seasonal memories of delight rush in when I first see the blossoms appear in the canopy of spring growth. One autumn for my birthday, my friend Theresa gifted me with a Maggiociondolo tree, knowing the story of how much I loved it. With loving intentionality, she planted it so that my kitchen window perfectly frames its seasonal beauty. When May arrives, the first blossoms begin to form, often coming into fullness right on Theresa’s birthday, when the days are long and warm. It feels meaningful that Maggiociondolo blossoms in the month that Angelo left this world, and that Theresa entered this world. Seeing its flowers fills my heart with golden memories of Trentino, and with gratitude for this living expression of friendship.